Jean Fournier Gallery was founded in 1954 by Jean Fournier (1922-2006). The gallery is now managed by Elodie Rahard and continues to operate with the support of Jean-Marie Bonnet. 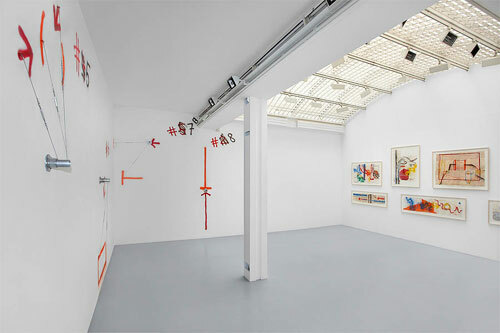 The Gallery is dedicated to abstract painting and the various forms of abstraction. For many years, Jean Fournier represented American painters having moved to France in the 1950’s, such as James Bishop, Sam Francis, Shirley Jaffe and Joan Mitchell. Jean Fournier also represented Simon Hantaï, and started showing is work in 1956. Since the death of the artist in 2008, the Gallery has continues the close collaboration with his family. Nowadays, the Gallery shows painters and sculptors, from Europe and the USA, whose work spans the 1980s and the 1990s : Stéphane Bordarier, Nathalie Elemento, Gilgian Gelzer, Claire-Jeanne Jézéquel, Frédérique Lucien, Pierre Mabille, Jean François Maurige, Christophe Robe, Peter Soriano and Claude Tétot. The Gallery is also supporting younger artists like Nicolas Guiet and Emmanuel Van der Meulen. In the last 4 years, the Gallery as started showing again works by Pierre Buraglio. Catalogs are published to support the exhibitions, with a text produce by an art critic. Those catalogs allow us to spread the knowledge of the gallery’s artist to the largest number of amateurs. Within its program, the gallery organizes one or two monographic exhibitions a year, dedicated to some of its historical artists ; 2006 : Sam Francis, works from 1960 to 1989 and Claude Viallat, works from 1966 to 1975 ; 2007 : Michel Parmentier, works from 1962 to 1994 ; 2009 : Jean-Paul Riopelle, works on paper, paintings and sculptures 1960 -1965 ; 2010 : Simon Hantaï, curator Molly Warnock (Organized jointly with Paul Kasmin Gallery, New York) and Michel Parmentier, paintings 1961-1968 ; 2012 : Simon Hantaï, Panses.